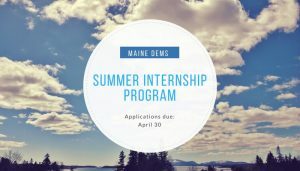 The Maine Democratic Party is looking for Maine’s enthusiastic, politically-minded, future leaders for our Summer Internship Program! Summer interns will get hands-on experience doing substantive work while learning the fundamentals of working in campaign politics. Interns will choose a focus in either organizing and outreach, finance, or communication, and develop key skills to prepare for future political opportunities in their focus. While each focus will offer a unique learning experience, interns will get to know all MDP staffers and gain exposure to all departments through brown bag lunch sessions, professional development workshops, and all-hands-on-deck events and projects. By the end of the summer, each intern should feel ready to jump onto the campaign trail or into a progressive organization. All internships are based in Augusta, Maine and are unpaid. Travel for assignments will be reimbursed. Part-time interns will be expected to commit at least 15 hours per week. Full-time interns will be expected to commit at least 30 hours per week. You can find more information here. If you have any questions regarding the program, please email internship@mainedems.org.